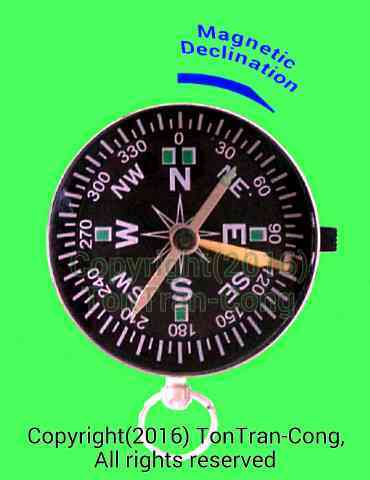 A magnetic compass can be used to determine local magnetic declination. This declination varies with location and time. The declination is compiled from local laboratories data and made into world charts for navigation but each person can also determine his current local declination by himself. Figure: Magnetic compass, dry, eddy-current-damped, ex-US Army. 3. A sighting compass as in the picture. Step 2: Determining local magnetic declination. Keep the sighting compass level and read the direction of Sunrise. Keep the sighting compass level and read the direction of Sunset. The bisector line of the two readings is the true North. The reading for the bisector is the mean value of Sunrise and Sunset values. The reading of the bisector line is the absolute value of magnetic declination. Magnetic declination is positive when magnetic North is East of true North and negative when West. When old maps are laid over current satellite based ones, we have interesting maps giving insight into the evolution of land use, the technology and defense concepts in ancient time, etc. Here are two maps, over 150 years old, placed over the current satellite based Open Street Maps, giving insight into the land use, technology, defense concepts in the 1800’s in South of Vietnam. 2. Map of the first Gia-Dinh (Saigon) Citadel (1790-1836) for the Vietnamese King. This citadel was built by Colonel (mercenary?) Victor Oliver in 1790 for the first Nguyen king (a warring party). Figure: Overlay of an old map drawn in 1799 on current Open Street Map. Original 1799 map has expired copyright. Open Street Map data are used under Open License. Open Street Map data are owned by Open Street Map Contributors (see website www.openstreetmap.org). This old citadel was built to be a capital citadel with a residence for the King and his royal family. It appears like it has been designed against attack from North West. It had fewer firing towers on the South East side. It may be speculated that the Vietnamese King had had control of the sea and therefore the Saigon river (called Binh-Duong river at that time) on its South East. To the North-West was the Khmer empire and the citadel was built to resist attacks from North West. It has a fighting wall, call Luy-Ban-Bich, extending out to its West. The red line in the map denotes part of “Ban-Bich-Co-Luy”, semi-circular wall for fighting. This wall was built in 1772 by Court Officer Nguyen-Cuu-Dam. It extended past the boundary of this detail map, followed the river and smoothly turned toward 300 degree direction, toward the current (2016) train terminal in Hoa-Hung, then turned sharply toward 225 degree direction to the (ancient) Cay-Mai Pagoda at the intersection of Hong-Bang street and Nguyen-Trai street. The fighting wall was 8km long and was built by the Vietnamese Court Officer Nguyen-Cuu-Dam. There is also another “Luy-Cat-Ngang”, wall for fighting which cuts across the field. Part of this fighting wall is over Binh-Long street, near the round about with 6 streets including Binh-Long, Thoai-Ngoc-Hau and Au-Co. The current street of Luy-Ban-Bich (in sub-District Tan-Thanh, District Tan-Phu, Saigon) is between the locations of two ancient fighting wall and is NOT anywhere near the “Ban-Bich-Co-Luy” it wants to honour. The street honoring Court Officer Nguyen-Cuu-Dam is also NOT anywhere near his celebrated “Ban-Bich-Co-Luy”. It is found in the original map by Court Officer Nguyen-Cuu-Dam that prior to the year 1790, Saigon area had been surrounded by a multitude of rivers, streams and Vietnamese dug canals. The area was thus well drained in that time. Planning schemes after 1975 did not pay much attention to this fact and created a flood prone city. It is also seen in this map that current main streets are built on top of ancient (1700’s) roads/streets or Vietnamese dug communication canals. The alignment of current city streets in the direction of North-East and South-East is due to the planning before the year 1790. 3. Map of the second and last Saigon Citadel (1836-1859). When the Governor Le-Van-Duyet of Gia-Dinh killed the father of a mistress of the 2nd Nguyen King, the King got upset. After the Governor died of natural death, he was posthumously trialed and convicted. His adopted son and followers revolted against the King. Few years later they lost and 1500+ of them were executed. The first Citadel was demolished by the King’s force in 1836. The King then built a second, smaller Citadel at the North corner of the large previous Citadel. Figure: Overlay of an old map drawn in 1815 on current Open Street Map. Original 1815 map by Tran-Van-Hoc has no copyright. Annotated map by Trinh-Hoai-Duc in Gia Dinh Thanh thong chi, in Viet Nam Nhat Thong Chi, Quoc Su Quan Vietnam has no copyright. Open Street Map data are used under Open License. Open Street Map data are owned by Open Street Map Contributors (see website www.openstreetmap.org). This second citadel looks like a fortress guarding against attacks in any direction. However it was inadequately equipped to resist the attack by a modern equipped alliance by France and Spain. After the fall of Gia-Dinh Citadel, the French left the wall structure alone until 1859. The wall structure can be seen in French drawn maps until 1859. It is seen in this map that many current main streets are built on top of ancient (1700’s) roads/streets or Vietnamese dug communication channels. Many of the Vietnamese dug water routes have been turned into surface routes. We have to wonder how rain water escapes in the year 1859. The ancient maps align remarkably well to the modern satellite maps; it was a remarkable feat by people at that time. The streets of Saigon seem to have been laid out since ancient time. The current flooding of the city is a result of human change to natural landscape and may not be a small problem. 1.Tran Van Hoc (1815), Plan de Gia-định et des environs, dressé par Trần-văn-Học, le 4e jour de la 12e lune de la 14e année de Gia-Long-1815. 3. Petrus Ky, Souvenir historique sur Saigon and ses environs. 4. Anonymous authors, Hinh Anh Viet Nam xua & nay, Hinh Anh Viet Nam xua & nay, http://hinhanhvietnam.com/ban-do-sai-gon-xua/, accessed Mar. 2016. 5. Mai Tran, Kể chuyện kinh cầu xưa vùng Sài Gòn Chợ Lớn trước 1975 (P1), maivantran.com, http://maivantran.com/2013/11/19/ke-chuyen-kinh-cau-xua-vung-sai-gon-cho-lon-truoc-1975-p1/, posted 19 Nov. 2013. 6. Nguyen Tien Quang, Bản đồ Việt nam xưa, http://www.nguyentienquang-huongtram.blogspot.com, http://www.nguyentienquang-huongtram.blogspot.com/2013/11/ban-o-sai-gon.html, posted 17 No. 2013. 7. James M. Haley, 1861 French Conquest of Saigon: Battle of the Ky Hoa Forts, Historynet.com, http://www.historynet.com/1861-french-conquest-of-saigon-battle-of-the-ky-hoa-forts.htm. posted 6 Dec. 2006. 8. James M. Haley, 1861 French Conquest of Saigon: Battle of the Ky Hoa Forts, Vietnam Magazine, June 2006 .